We all want a bathroom like a luxury spa, a place where we can relax on our own and feel pampered and privileged. 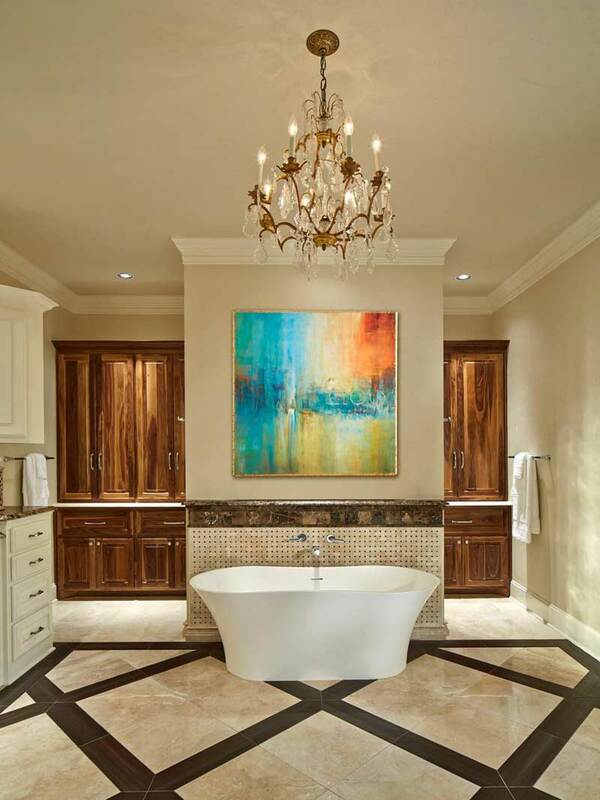 A truly beautiful bathroom requires both good tastes in design and flawless execution. Beyond those essentials, it’s only limited by your budget for bathroom renovations. No matter what that budget is, you should prioritize practical design for ease of use and aesthetic, tasteful decoration. A bathroom that has ergonomic issues or boring decorations will never appeal to anyone. 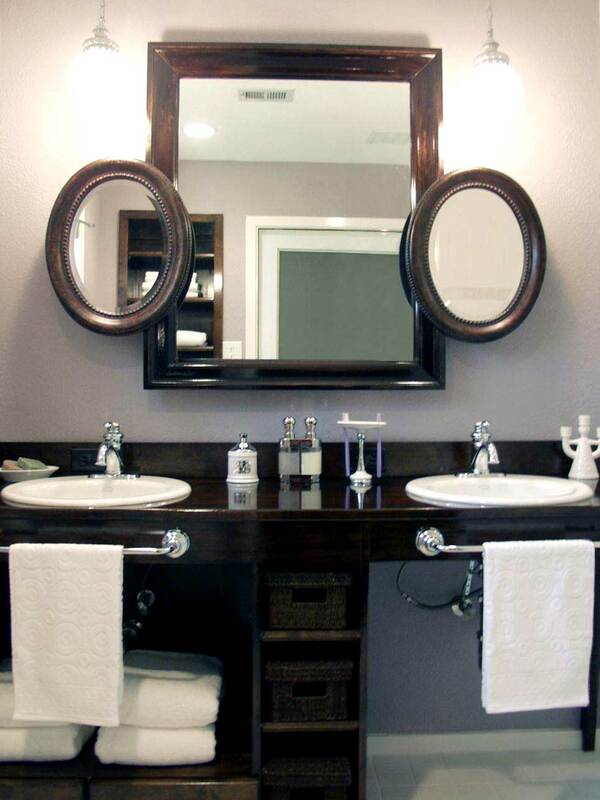 Bathroom walls can be decorated in many ways by using pictures, mirrors, storage areas, etc . To help you out we have selected 35 pictures of classy-looking bathrooms – and they’re all quite budget-friendly, too! 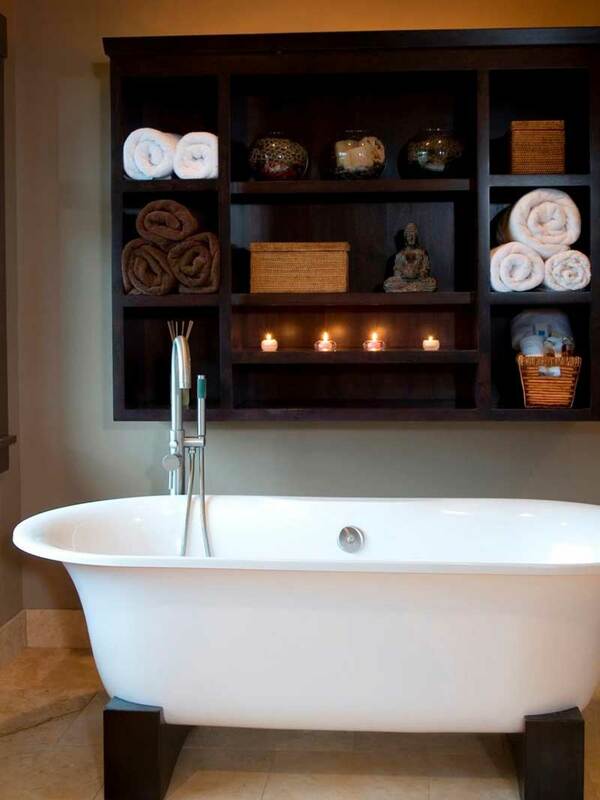 Use the below designs to turn your bathroom into your personalized spa area! This beautiful golden sunburst mirror adds to the classic look of the dark colored wall. In this picture, the dark chocolate wallpaper itself creates an ultra-rich feeling that’s only highlighted by the golden rimmed mirror. It’s just a perfect match! 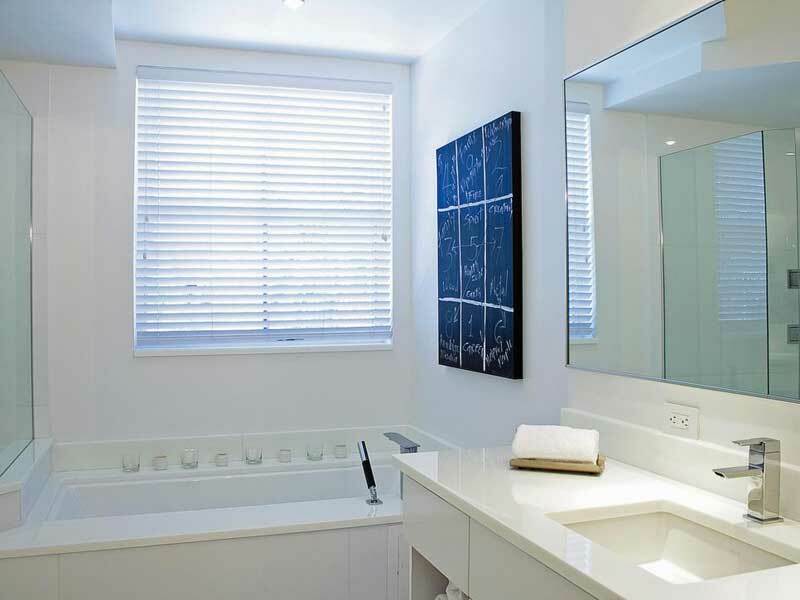 In this simple bathroom, the focal point is the black decorative mirror. Keeping everything else in neutral shades (including the walls) makes this beautiful black and silver designer mirror stand out. 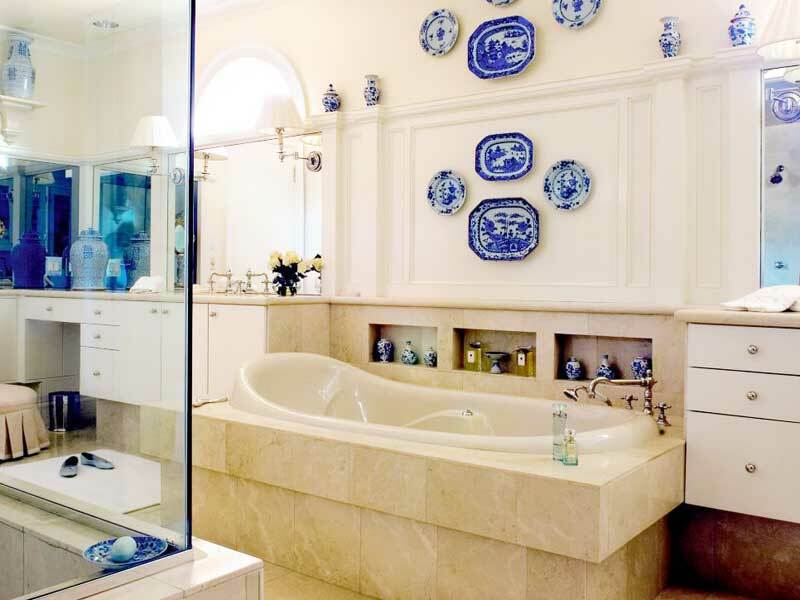 In this all-cream bathroom, the blue and white plates steal the show with their artistic look. These and the other blue accessories are shown in the mirror complement the decorations of this bathroom and colorfully break up the flow of cream color. This tiny bathroom becomes impressive thanks to the sumptuous teal-blue patterned wallpaper. The color totally enhances the beauty of the bathroom. Also, notice how the white background for the fixtures makes the bathroom look airy even with dark colored floor and wallpaper. 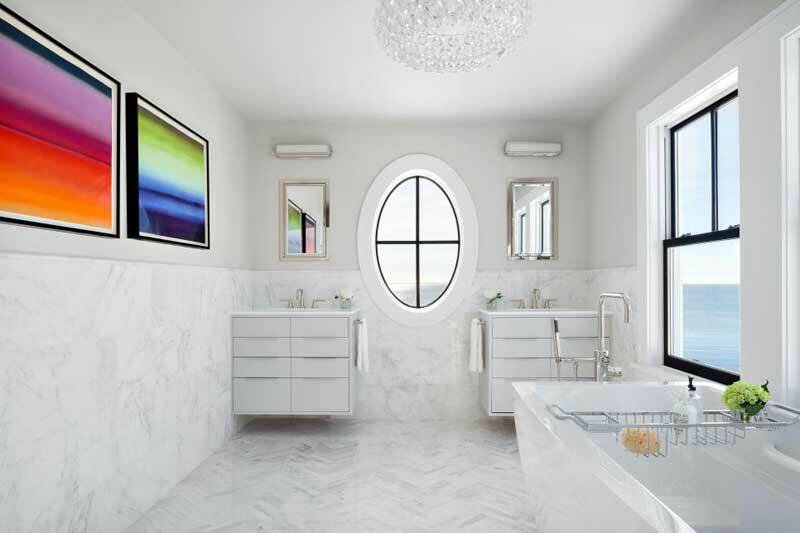 Bold and shimmery black and white walls will attract looks in any bathroom. When paired side by side they look gorgeous and unique. The focused ceiling light highlight the walls and makes the contrast even more dramatic. 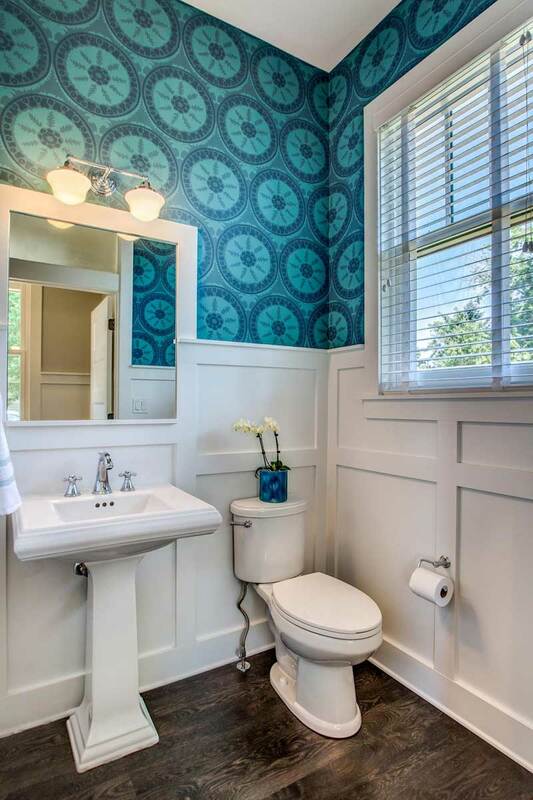 The broad and bold blue and white wallpaper gives an antique look to the bathroom and makes it appear airier. Red accessories are used to break the flow and highlight the wall. Who would have thought that old bed sheets could be used so nicely as a decorative accessory? 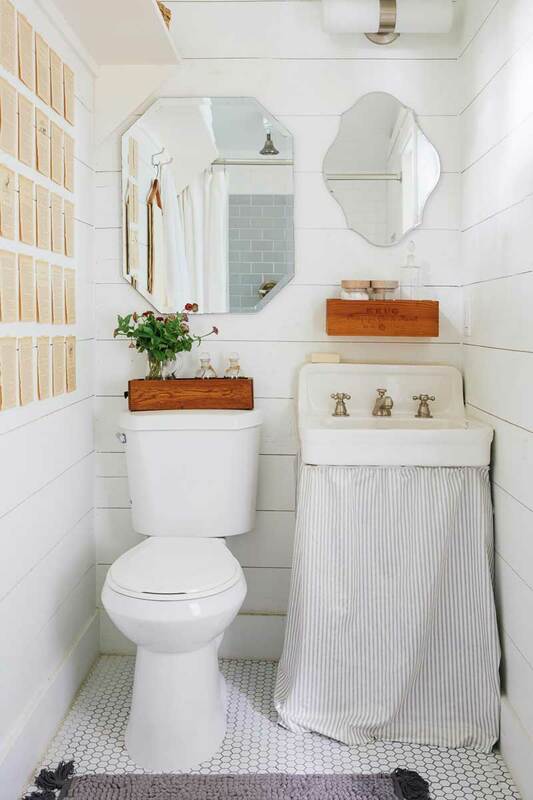 This owner is brilliant and has used this little-to-no-money-involved item to give her minimalist bathroom a great decorative look. 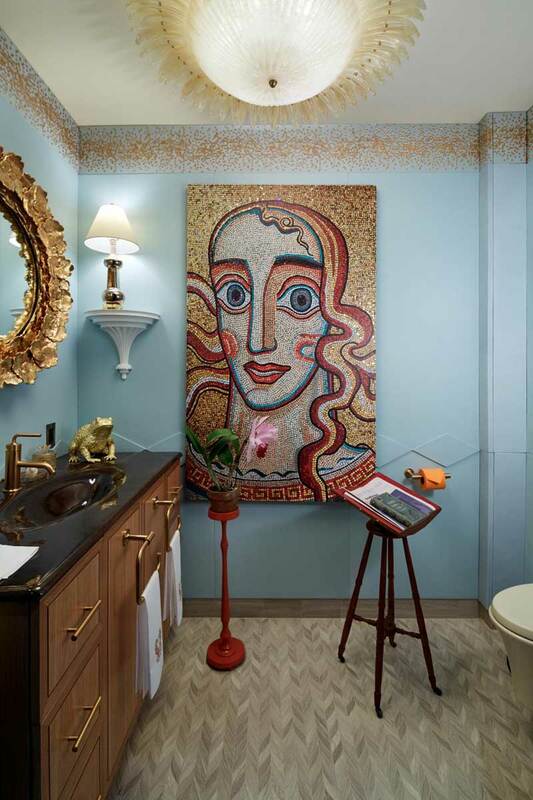 In this bathroom, the colorful artwork acts as a central focal point, but the teak cabinets and red towels also add color and punctuate the cream. 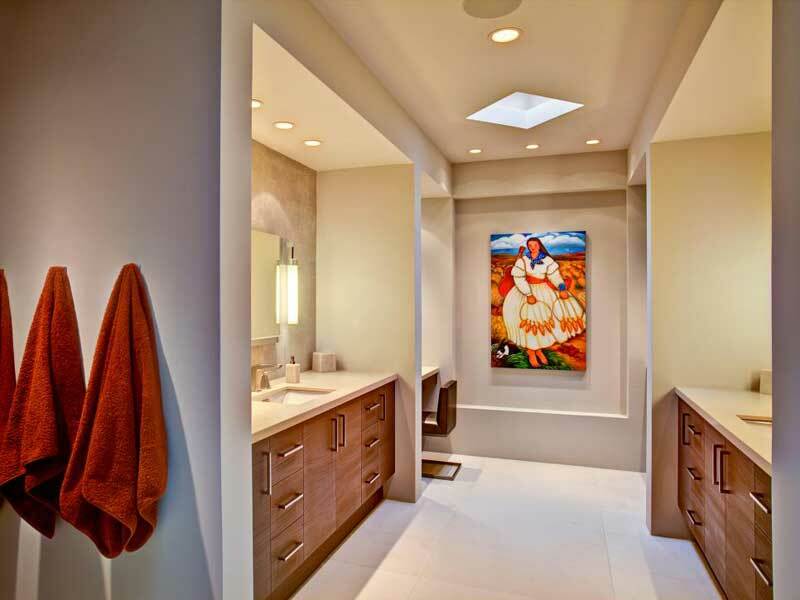 The wall design where the artwork is placed adds drama to the whole bathroom. 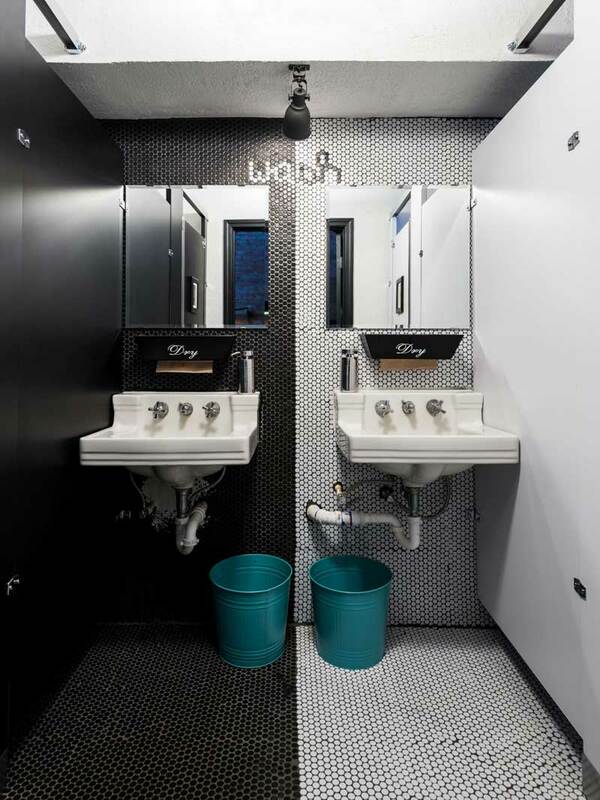 This bathroom is designed with contemporary artwork to interrupt the uniform flow of color. 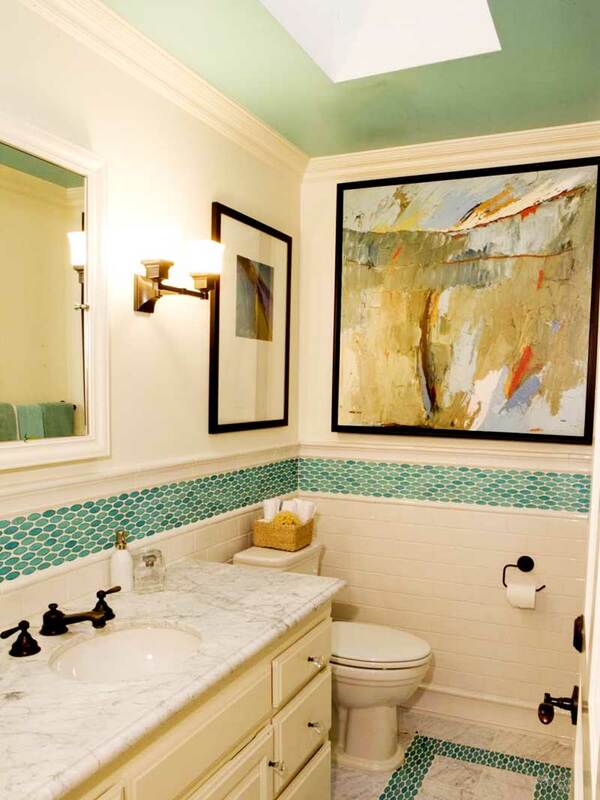 Teal-colored highlight tiles on the floor and paint on the ceiling also enhance the look of the bathroom, while the colors in the art add to its character. 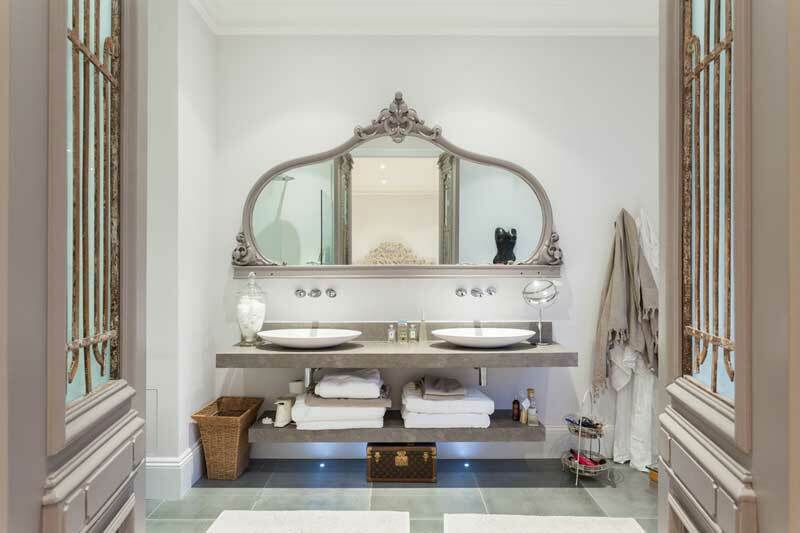 This bathroom is an absolute marvel – everything is chosen so perfectly! The flowered wallpaper adds a beautiful look which is highlighted by the round contemporary mirror. 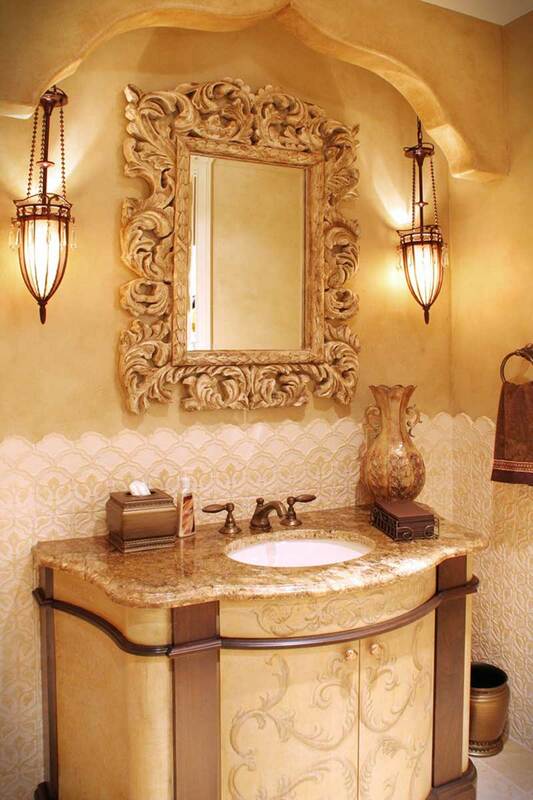 The three bell-shaped lights add additional character to the bathroom. 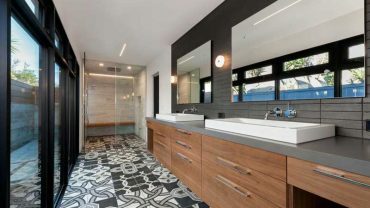 The unique design of the mirrors acts as a focal point in this bathroom. 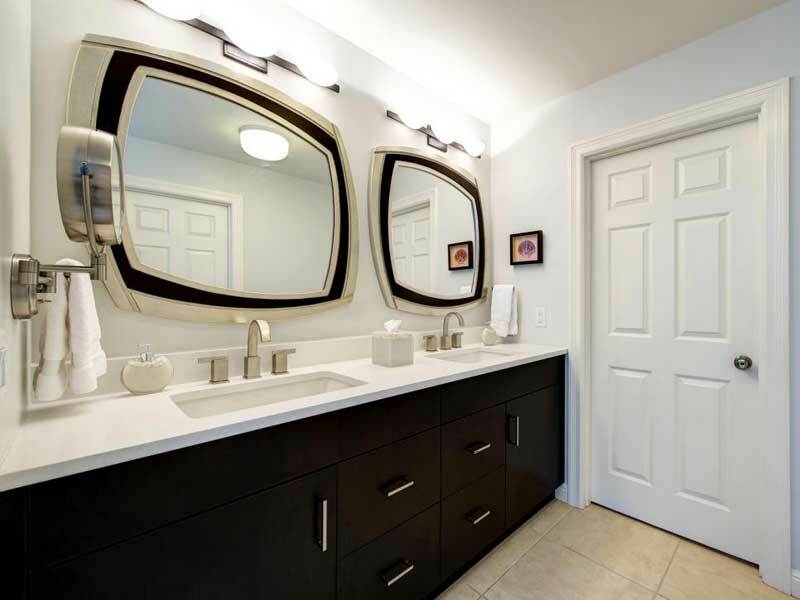 Not only that, the dark wood colored cabinets match just perfectly with the golden framed mirrors. 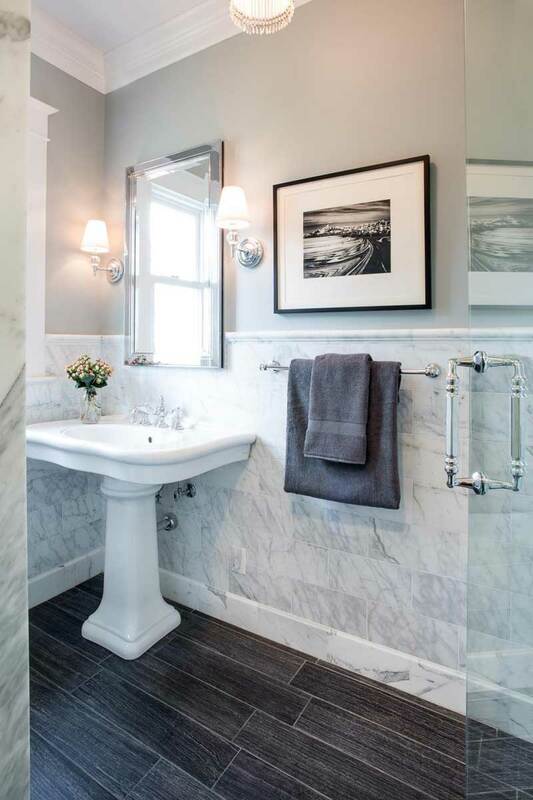 Along with the frames, the golden faucets are another element that adds sheen to this bathroom. Having a blackboard in the bathroom is an excellent DIY idea – the kids are gonna love it. It works especially well in this all-white bathroom, where the blackboard is the focal point. It is not just wallpaper or mirrors that accentuate the look of bathroom walls; aesthetically designed storage areas will certainly enhance the look too. In this picture, the dark wood shelf adds color and drama to the bathroom, and of course, its large divisions are useful for holding accessories. 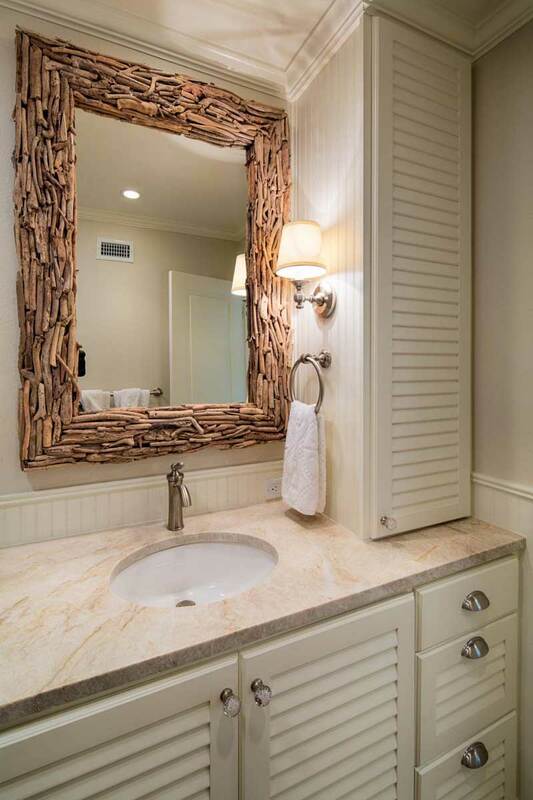 This bathroom breaks its natural white-cream flow of color efficiently by using a driftwood mirror frame that attracts the eye of anyone who enters the bathroom. The brown colored driftwood adds an eco-friendly look to the bathroom. 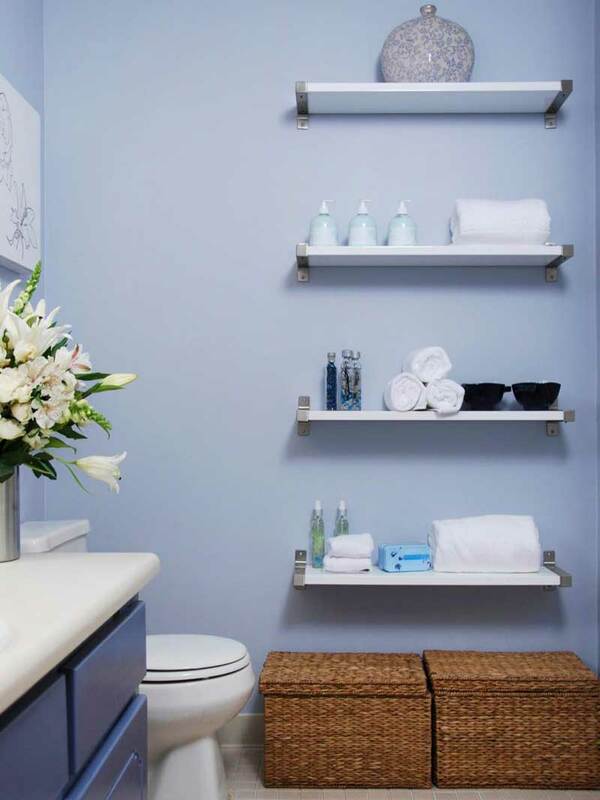 Following the minimalist approach, the usage of floating shelves is a brilliant idea to hold the accessories and make your bathroom walls appealing. The contrasting white of the shelves against the blue walls adds to the drama. Another minimalist approach here! The glass shelves keep things straightforward and elegant; they also reflect light from the white walls to make the room feel more spacious. 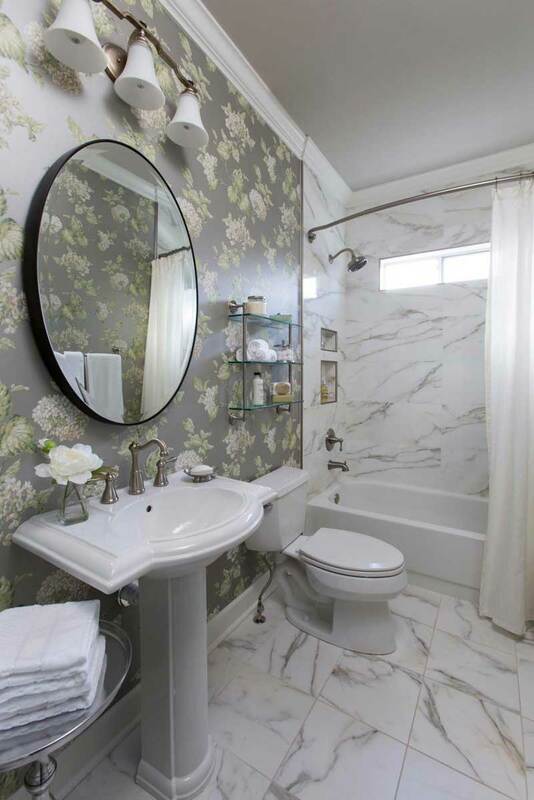 A beautiful beige wallpaper decorates this bathroom, highlighting it in a sophisticated way and making it look trendy. The shimmery golden picture frames add elegance to the wall. If you want your bathroom to feel vintage and trendy at the same time, then this is what you should have on the walls. The layered mirror adds drama to the entire bathroom and is a great complement to the dull off-white wall. 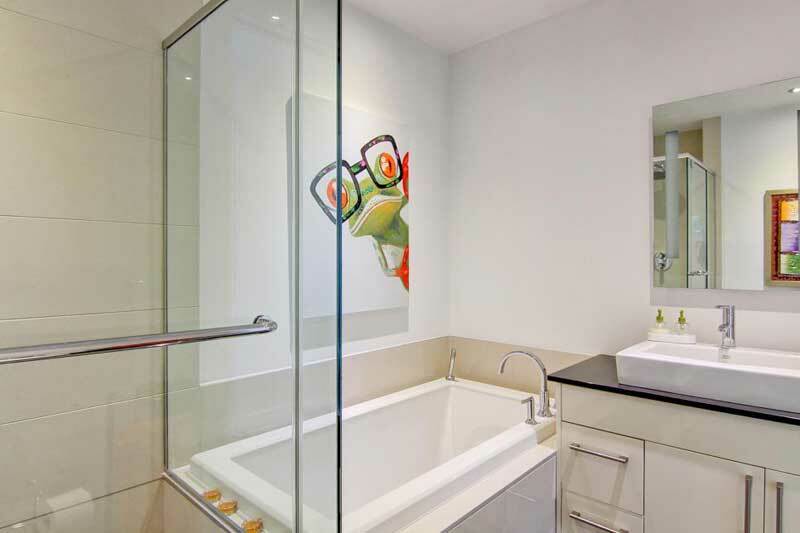 This colorful modern art adds life to the entire bathroom. Adding a vibrant color element will balance the dullness in a room when everything else is sober in color. This beautiful modern baroque mirror is the unquestioned focal point of the bathroom. The frame is only slightly darker than the wall, so the decoration blends in so well that it creates a magical look. 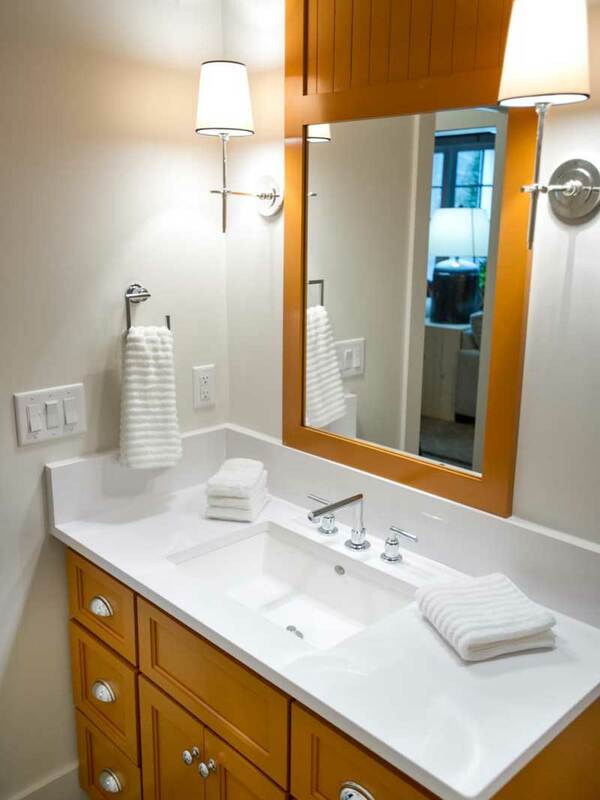 A mirror as wide as the basin-sink-holding counter top works very well here. This rococo bathroom has a lot going on, but the focal point is probably the colorful mosaic art wall decor, which gives it an even more vibrant edge. The heavy golden mirror frame works well to balance and complement it. Having a mural in the bathroom is another great idea for decoration. You can use any color and design you want. 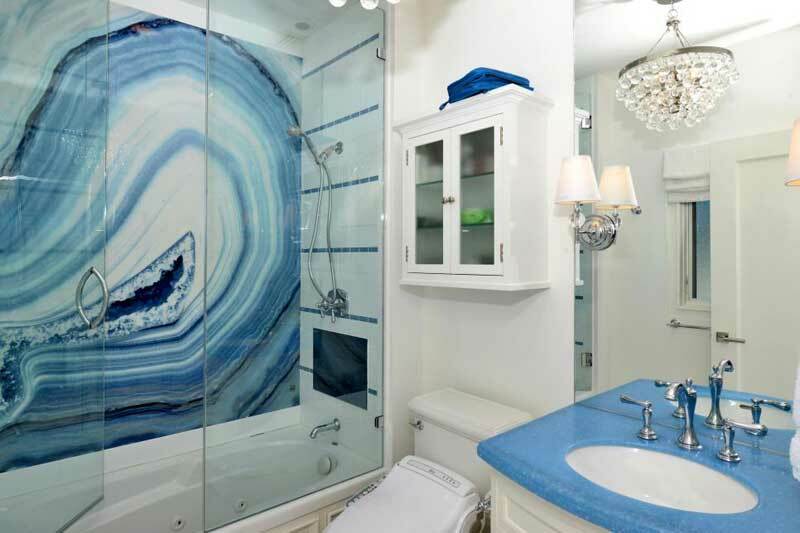 In the above picture the host has created a beautiful balance with the use of blue and white colors, and that sea wave mural is a perfect fit for a shower. 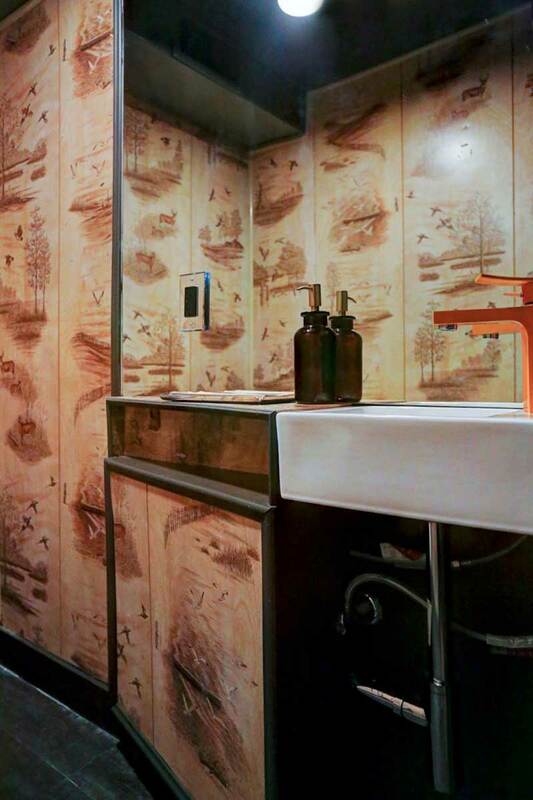 The neutral colored but artistic wallpaper in this bathroom creates some drama without complicating things overmuch. One benefit of using single-color wallpaper is that light gets distributed equally across all the corners of the bathroom. 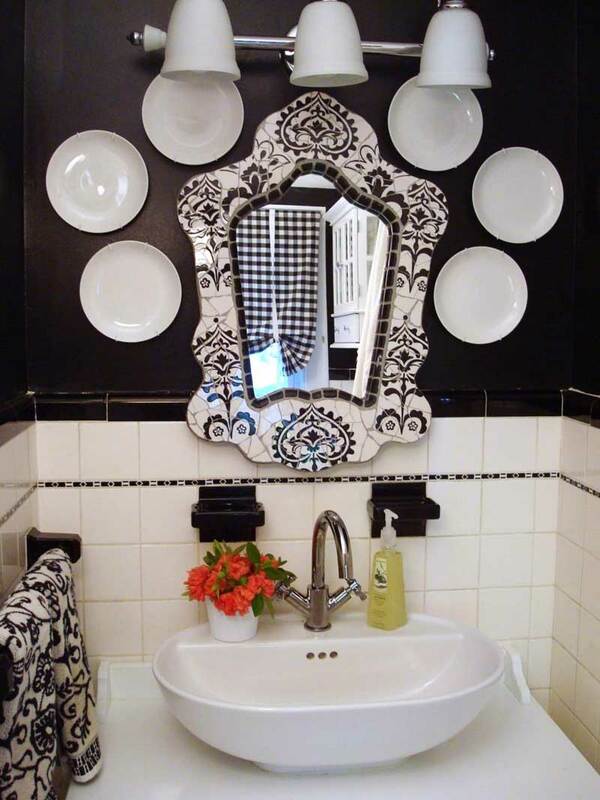 This beautiful and ornate black and white mirror definitely adds an essence of luxury to the walls of this bathroom. It blends perfectly with the two-tone wall and creates an awesome focal point. 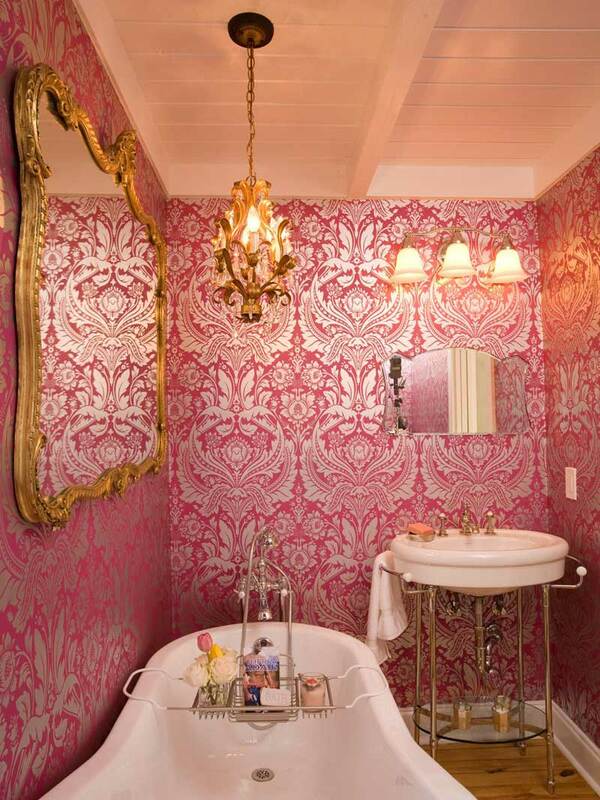 The ornate pink wall is all about luxury at its most baroque. This beautiful silver and pink wallpaper creates a magically royal environment. 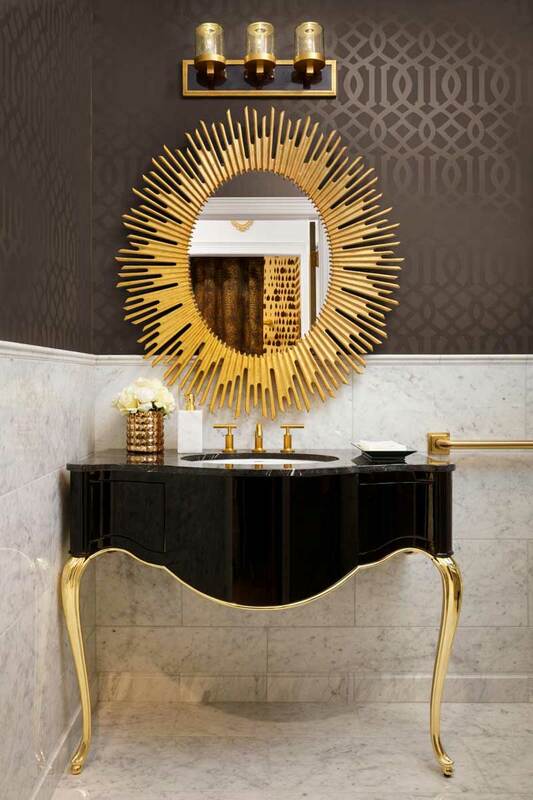 Complementing this is the bold golden mirror, a definite plus that makes the bathroom wall highly attractive. This colorful pop art image definitely draws the eye from all the whites around the bathroom. It’s a vibrant focal point that makes an otherwise plain bathroom wall more appealing and desirable. 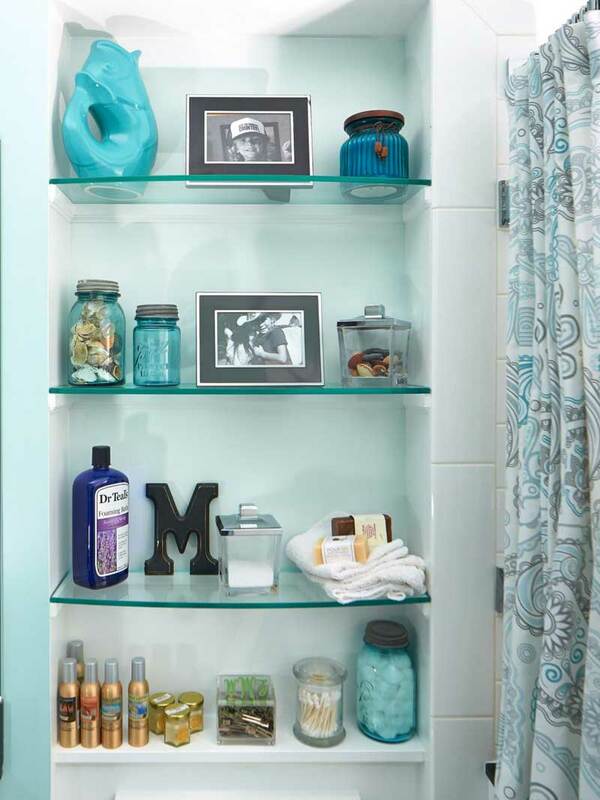 The simplest and easiest way to decorate your bathroom wall is to hang print images. 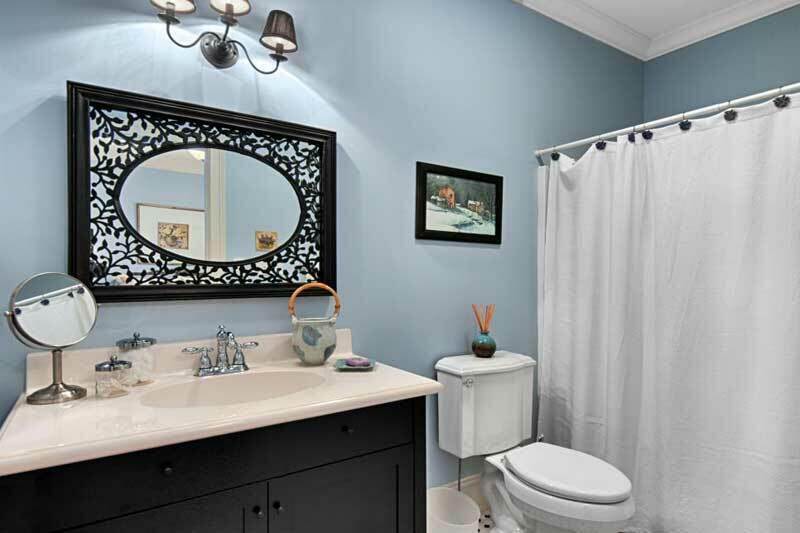 Here they’ve used a dark blue scenic print which blends very well with the all-white bathroom. 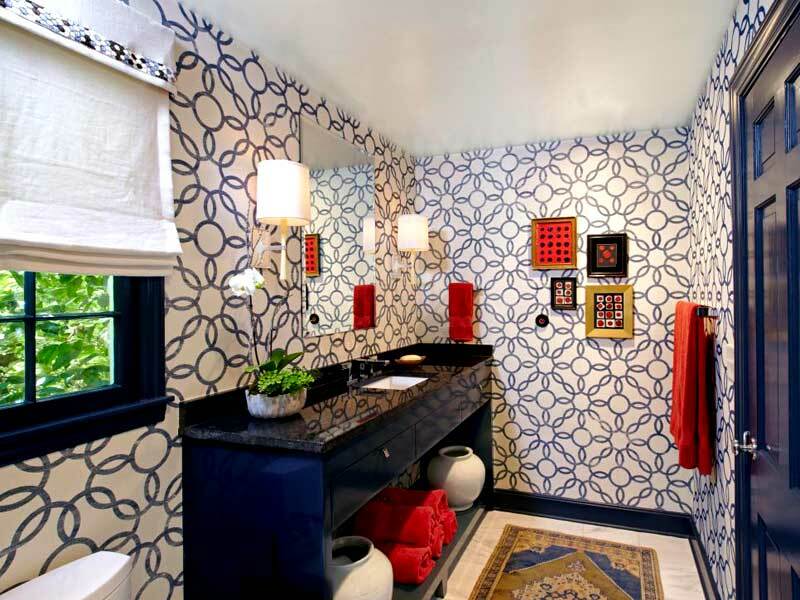 When considering prints, just remember the color of your bathroom so that print will blend in well. 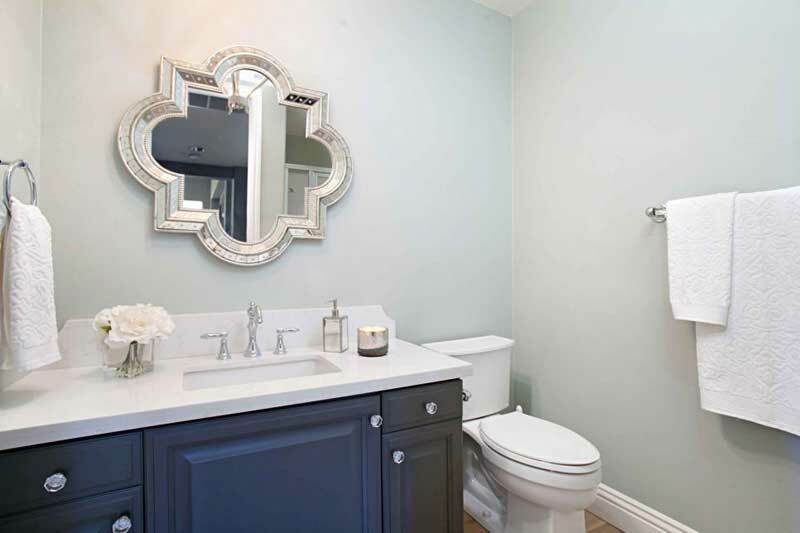 This beautiful quatrefoil mirror adds subtle drama to the wall and the bathroom as a whole. The dark colored cabinets and the unique shape of the mirror highlight the entire design of the bathroom, keeping it simple and elegant. This big rococo mirrors gives this bathroom an entirely vintage look and adds tremendous drama. The frame color and the wall color blend in so well that they seem like an ideal match. The hanging lights with their unique shape give an exclusive look to the wall. Everything on this bathroom wall is perfect – the mirror, the photo, and those small mounted lamps add a unique essence to the whole of the bathroom. The light fixtures and rest of the accessories used here go very well with the dark colored floor. This bathroom wall is decorated with a simple mirror flanked by stainless steel lights. 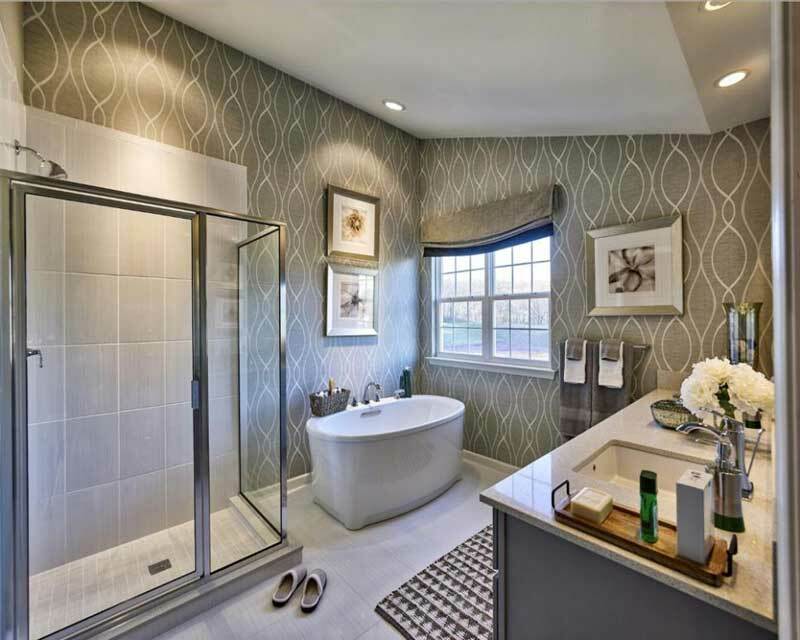 Though this bathroom looks very simple, it is neatly done and thus stylish and elegant. Without much in the way of accessories around, this is a practical yet minimally styled bathroom. 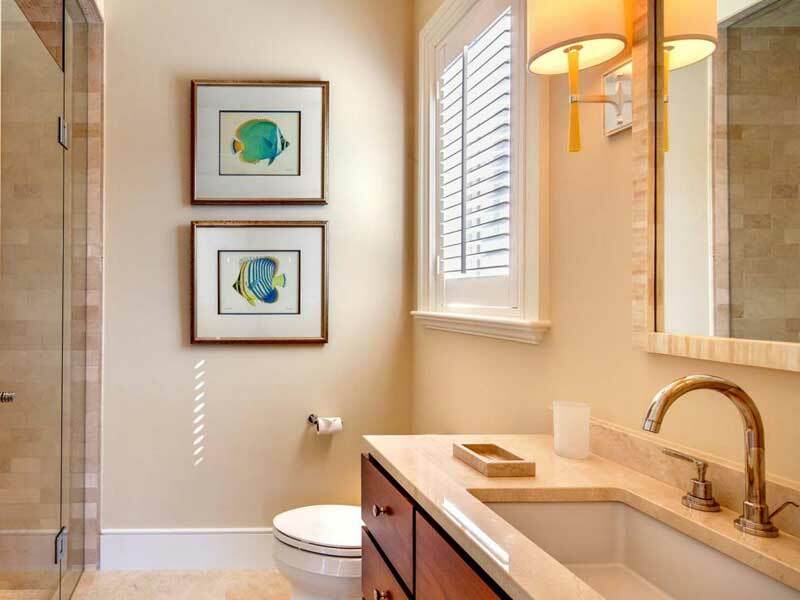 This beautiful, cozy beige bathroom breaks the color flow with a focal point of vibrant tropical art wall hangings. The all-beige look gives that extra airiness to the bathroom, while the bronze colored picture frames highlight the wall color. Set among relatively somber colors, the vibrant green wall art gives a refreshing focal point to the bathroom walls. 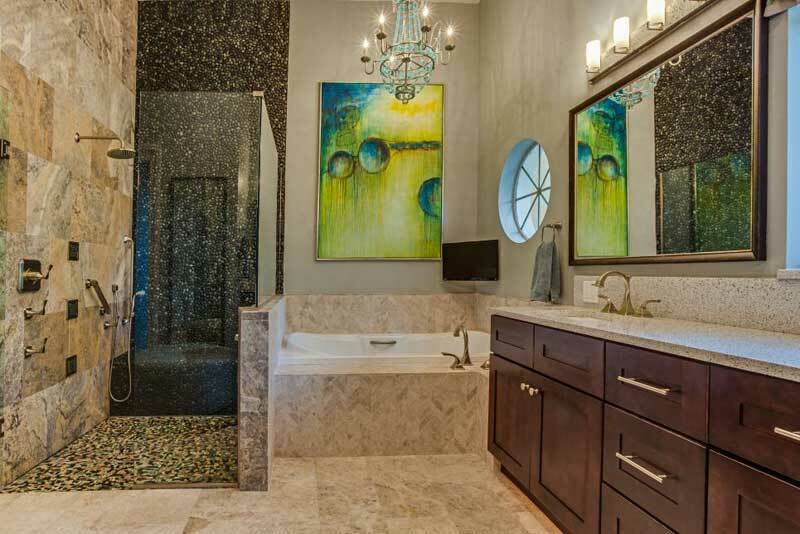 This adds an essence of luxury and vibrancy that defines this classy bathroom. These super-vibrant pictures create a focal point that can’t be ignored. When everything else is white, it is really wise to use bright colors rather than neutral tones to break the flow. 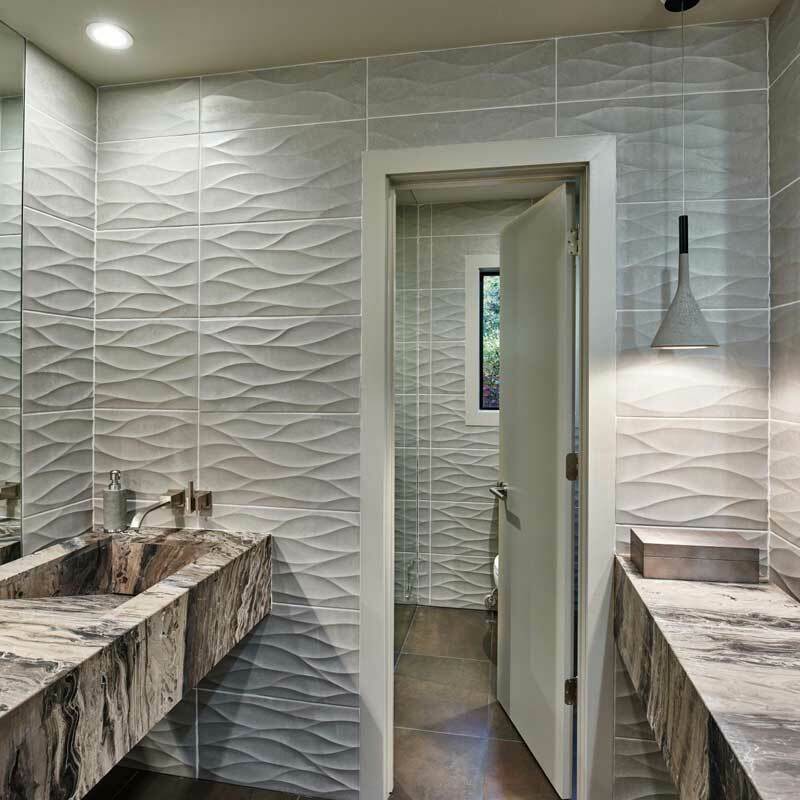 The deeply textured wall tiles create a unique atmosphere in this bathroom while keeping it airy and appealing. The sober colors give the bathroom an expensive look.